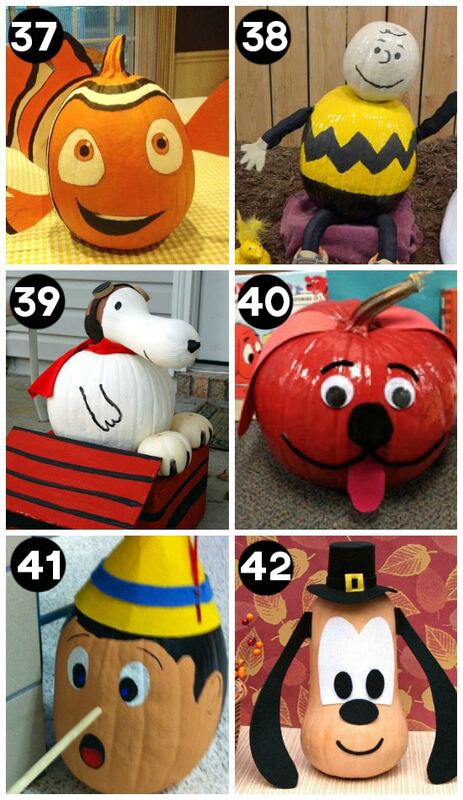 Whether you’re looking for creative pumpkin carving ideas for a family night, new pumpkin decorating ideas for your home OR just want to find some new pumpkin ideas for a decorating contest – you’re sure to find the perfect pumpkin designs here! Psst… carving pumpkins also makes a fabulous date night! Take a trip to the Pumpkin Patch and collect your pumpkins! 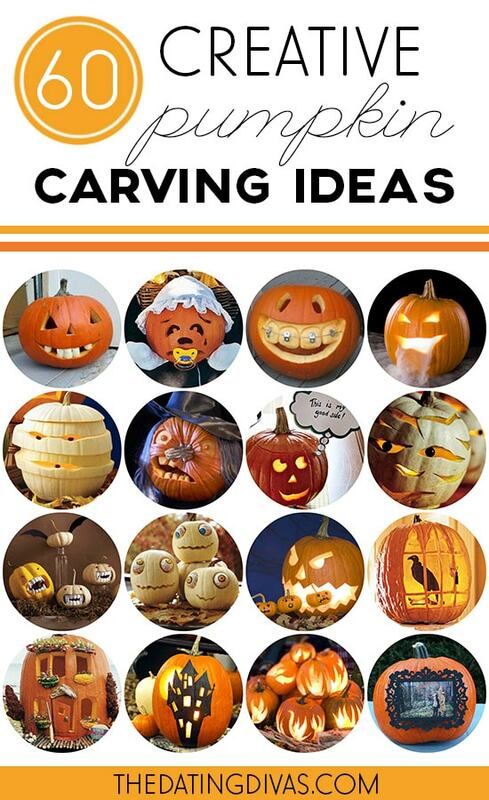 Then have a fun family night picking out pumpkin designs and helping the kiddos carve their pumpkins. Save YOUR pumpkins for an at-home date after the kiddos are in bed. This post contains affiliate links. To learn more about ’em, click here.Carving and decorating pumpkins together is one of my FAVORITE Halloween traditions! After we make the annual trip to the pumpkin patch, my kids can’t wait to start working on their masterpieces. 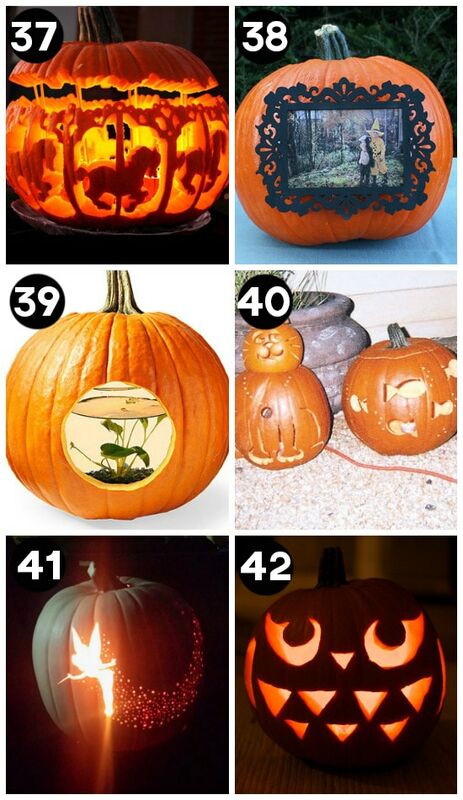 In the past, we have stuck with the traditional pumpkin designs and patterns. But after discovering all of the seriously FUN and CREATIVE pumpkin carving ideas on Pinterest, I think that might be changing. 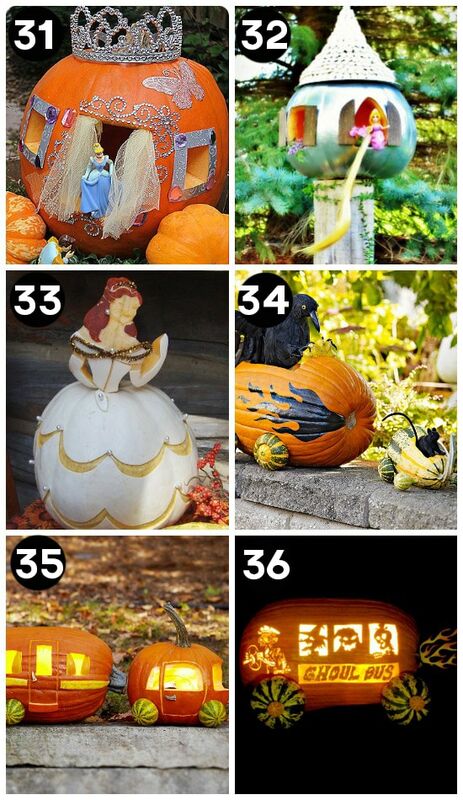 Just wait until you see all of the cute, funny, and unique Halloween pumpkins that we’ve found! Because carving pumpkins can be a lot of fun but, let’s face it, after several hours of helping three little ones clean out pumpkin guts – NO carve ideas are sounding pretty good! 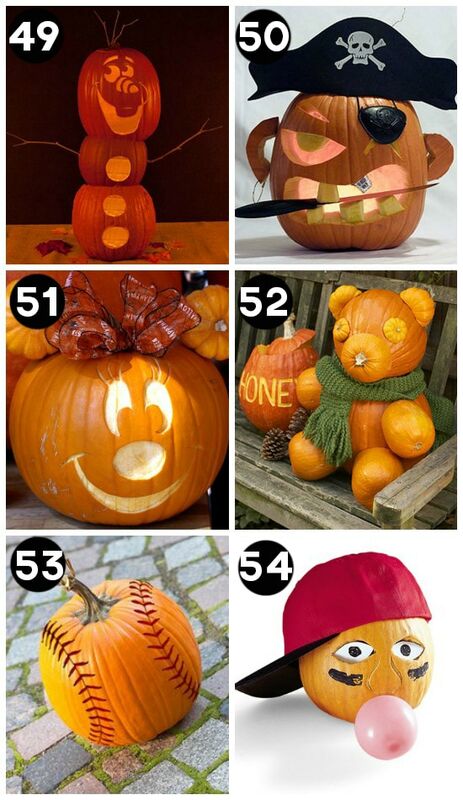 Whichever route you go, you’re sure to find LOTS of pumpkin decorating ideas below. If you do go the carving route we highly suggest grabbing a kit like this before getting started on your pumpkin designs! 1. Marshmallow Teeth– Just add mini marshmallows to your usual jack-o-lantern to make fun teeth! 2. 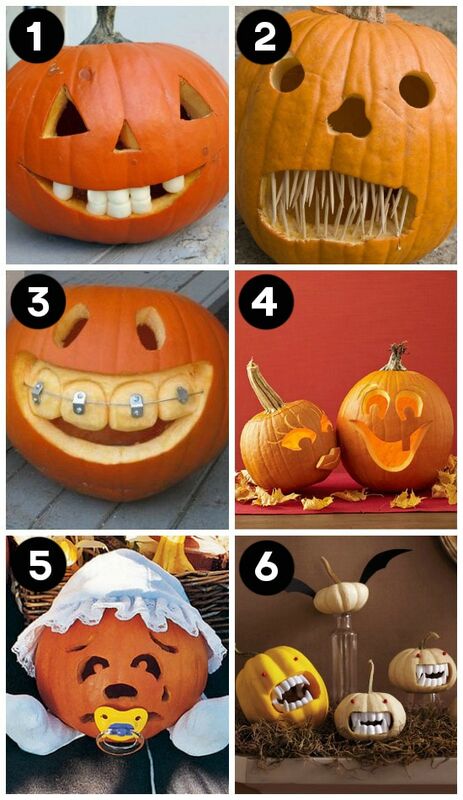 Toothpick Teeth– For scarier teeth, use toothpicks – is that not the easiest of pumpkin decorating ideas?! 3. Braces on Teeth– A little wire and some metal make cute braces! 4. Sweetheart Pumpkins– How cute are these his and hers pumpkins? 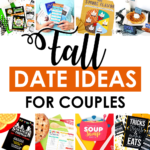 These pumpkin designs are perfect for sweet Fall date night! 5. Baby Pumpkin– Just add a pacifier and baby bonnet to make a baby jack-o-lantern. 6. Fanged Pumpkins– You don’t even have to carve out the teeth, just add plastic vampire teeth like these to jazz up your jack-o-lantern. 7. Dry Ice Jack-O-Lantern– Placing dry ice inside your pumpkin adds an extra spooky effect. Or, you could try a mist-maker! 8. 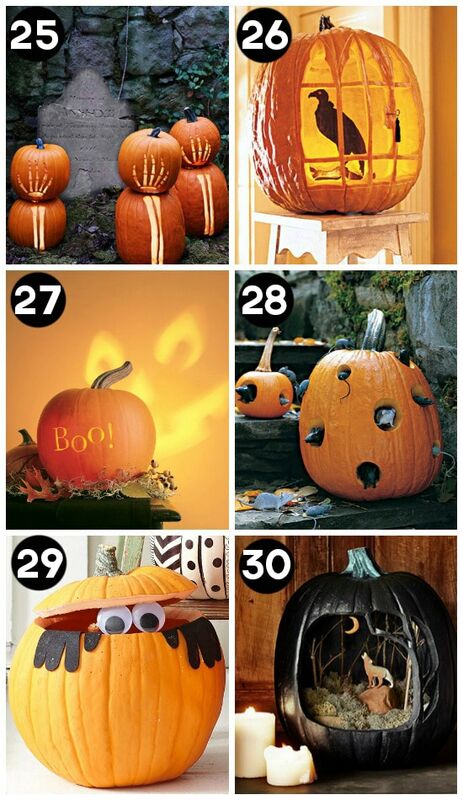 Zombie Pumpkins– These googly-eyed pumpkins look awesome and are so simple to make. 9. Mummy Pumpkin– Instead of the usual jack-o-lantern, try this fun mummy. 10. Witch Pumpkin– Turn the pumpkin on its side and use the stem as a witch’s nose! Top it off with this hat and you have the perfect witch pumpkin! 11. White Mummy Pumpkin– Use a white pumpkin or gourd to make this clever mummy. Just re-stack the cut slices in a different order to make the effect. 12. Shish-Ka-B00– Shish-ka-bob some mini pumpkins for your jack-o-lantern to eat with skewers like these. 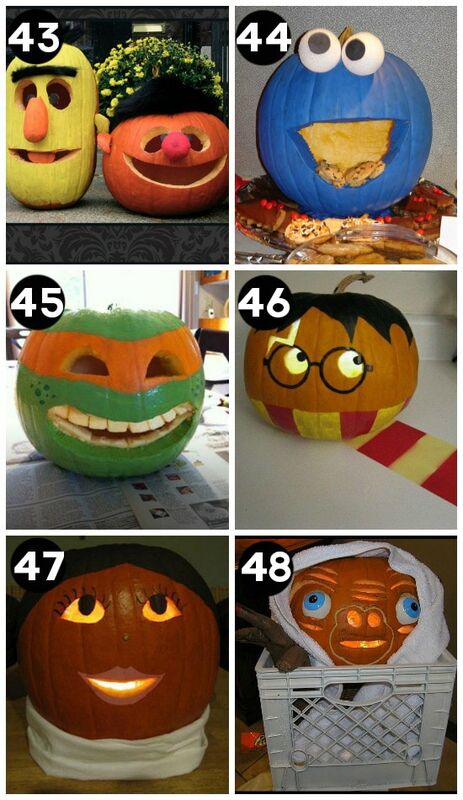 I love pumpkin decorating ideas like this one! So clever. 13. Thought Bubble Pumpkin– Here’s a super simple idea to add some fun to your usual jack-o-lanterns. 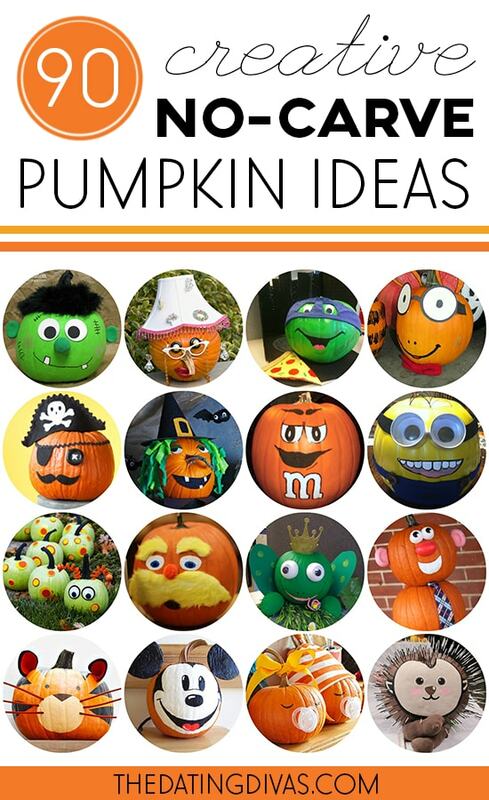 Let the kids each make a thought bubble for their pumpkin! Don’t feel like cutting out thought bubbles? Try these! 14. Baby’s First Halloween– How darling is this?! Use the outline of your baby’s hands and feet to make his first jack-o-lantern. 15. 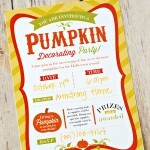 Party Pumpkins– Add festive party hats to your jack-o-lanterns to make a gathering of party pumpkins. 16. Masquerade Pumpkins– Or add these fun masks to your jack-o-lanterns to take it up a notch. 17. Monster Pumpkins– These silly-faced monsters are a wonderful non-scary option for the little ones. Try out these giant googly eyes! 18. Haunted Mansion– Carve the windows out of a haunted mansion for an impressive yet simple display. 19. 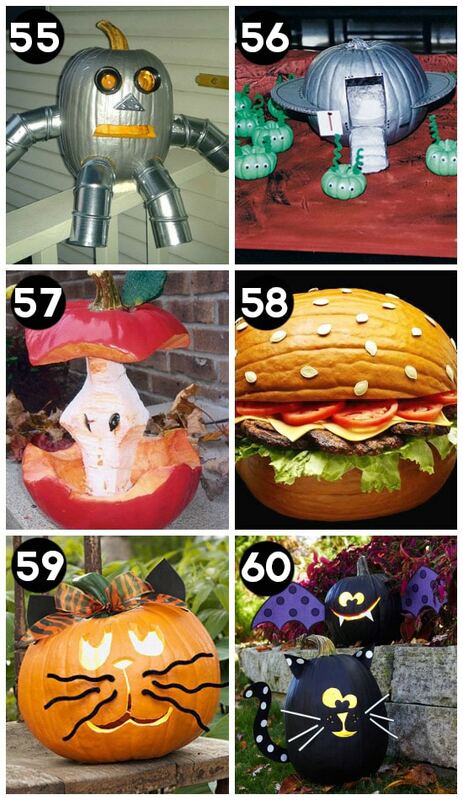 House Pumpkin– Need a few pumpkin decorating ideas that your most imaginative kid will love? Turn your pumpkin into a miniature house, complete with windows and door. Fairy garden kits are perfect for this style of pumpkin! 20. Lantern Pumpkins– Instead of a jack-o-lantern, why not just make a lantern? 21. Monogram Pumpkins– Monogram your family pumpkins with your initials. 22. Message Pumpkins– Forget the complex carving, use an electric drill to make your holes. You can even spell out a fun message! 23. Cookie Cutter Carving– Here’s another anti-carving method. Use cookie cutters to make your shapes. It doesn’t get easier than that! 24. Pumpkin Flames– How impressive is this pile of pumpkins? 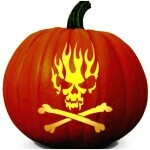 Carve out flame shapes to make your own pumpkin bonfire. 25. Skeleton Arms– These creepy, clever pumpkin designs look like skeleton arms are really reaching up from under the ground. Yikes! 26. Birdcage Pumpkin– Carve your pumpkin into a cage for a plastic bird from the craft store. 27. Wall Projection Pumpkin– This two-sided pumpkin has a Halloween message and projects a spooky face onto the wall. 28. Mouse Motel– Carve holes into your pumpkin for some plastic mice to hide inside. 29. Peek-a-BOO Pumpkin– No need to carve a whole face. This design is both cute and easy with just the eyes! 30. Pumpkin Diorama– Carve a large hole into your pumpkin and create a fall diorama. 31. Cinderella’s Carriage– What little girl wouldn’t LOVE to turn her pumpkin into Cinderella’s carriage? Including a few of these and topping it off with this would finish this perfectly!! 32. Rapunzel’s Tower– Or why not carve her pumpkin into Rapunzel’s tower? Don’t forget to add in a few of these! 33. Belle– If you’re an expert at pumpkin carving, you might try your hand at this beautiful Belle pumpkin. 34. Pumpkin Cars– Turn your pumpkin on its side to transform it into a car. Mini pumpkins or gourds make the perfect wheels. 35. Car & Camper– Why not make a whole car and camper combo? 36. Ghoul Bus– Instead of a school bus, try your hand at this Halloween ghoul bus. Pretty clever, right? 37. Carousel– If you’re up for a little bit of a challenge, try making this haunted carousel. 38. Picture Frame Pumpkin– I just love this picture frame pumpkin. Click to see what it looks like when it’s all lit up at night. 39. Fishbowl Pumpkin – It doesn’t get any more creative than this. Stick a fishbowl inside your pumpkin! 40. Cat and Fishbowl– Or use two pumpkins to make a cat and fishbowl combo. 41. Tinkerbell & Pixie Dust– Doesn’t this pumpkin look amazing?! You won’t believe how easy it is to make Tinkerbell’s pixie dust trail. 42. Owl– This owl design is super cute and super easy to pull off! 43. 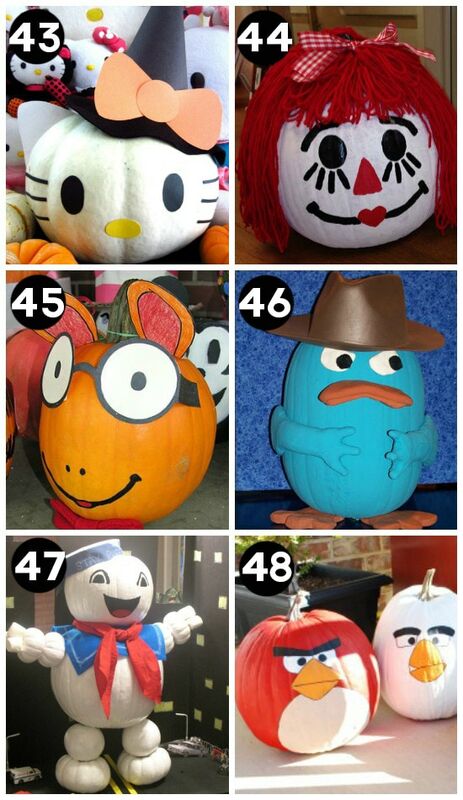 Bert & Ernie– The cutest pumpkin decorating ideas for creating everyone’s favorite Sesame Street characters. Just use a long tall pumpkin and a short fat pumpkin to make Bert and Ernie jack-o-lanterns. 44. Cookie Monster– How fun is this Cookie Monster jack-o-lantern? I love the pile of cookies inside his mouth. 45. Ninja Turtle– Have any TMNT fans at your house? Let him carve his pumpkin into his favorite ninja turtle. 46. Harry Potter– Turn your pumpkin into everyone’s favorite wizard, complete with glasses and scar. This would be the perfect pumpkin to pair with our Harry Potter date night! 47. Princess Leia– This one’s for all the Star Wars fans out there. Try making a Princess Leia jack-o-lantern. 48. E.T.– This E.T. jack-o-lantern is just too clever for Halloween. I love that they have it covered in a crate and everything. 49. 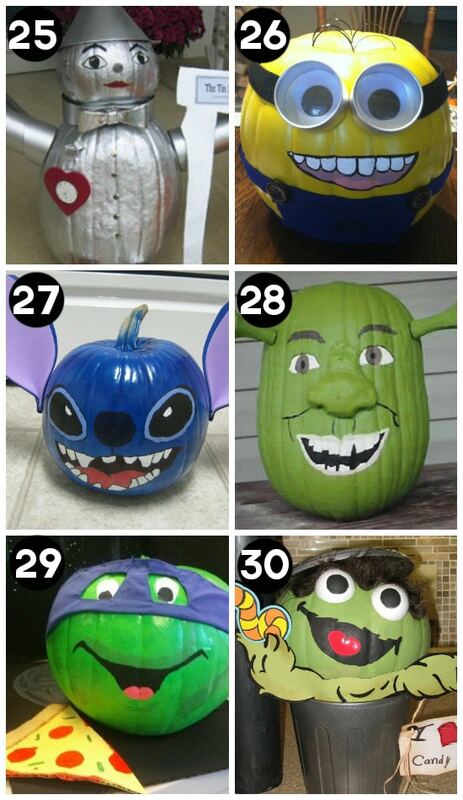 Olaf– With Frozen being so popular, I imagine an Olaf jack-o-lantern would be a favorite this year. 50. Pirate Pumpkin– Add a hat, eyepatch, and a fake knife to make a pirate pumpkin. 51. Minnie Mouse– Okay, isn’t this Minnie Mouse pumpkin darling? I love the bow and the mini pumpkins used for her ears. 52. Bear & Honey Pot– Twelve pumpkins and gourds of varying sizes are used to make this cute bear and his honey pot. 53. Baseball– Here’s an idea for all you baseball fans. Turn your pumpkin into a giant baseball! 54. Ballplayer– Or make this clever baseball player jack-o-lantern. A pink balloon makes the perfect bubble gum bubble. Don’t forget the hat! 55. Robot– Check out this fun robot pumpkin. What kid wouldn’t like to create his own robot for Halloween? 56. UFO & Aliens– Here’s another super creative idea. Use a large pumpkin for the UFO and mini pumpkins for the aliens. I just love the pipe cleaner antennas. 57. Apple Core– This apple core pumpkin was made using pieces of painted pumpkin. 58. Hamburger– The pumpkin gets major creativity points. Turn your pumpkin into the buns of a hamburger and save the seeds for the top bun. Genius! 59. Scaredy Cat– You’ve gotta love this simple cat-faced jack-o-lantern. Especially it’s black pipe cleaner whiskers. 60. Black Cat and Bat– A little black spray paint and colored cardstock make this black cat and bat. So, you want to get in the Halloween spirit but getting out a super sharp knife with small kiddos underfoot isn’t your idea of fun? 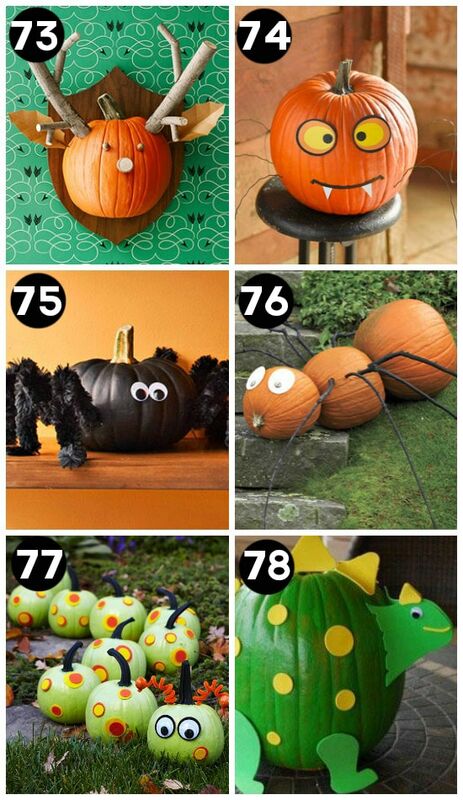 Don’t worry, these creative pumpkin decorating ideas can easily be recreated with a few, simple craft supplies. 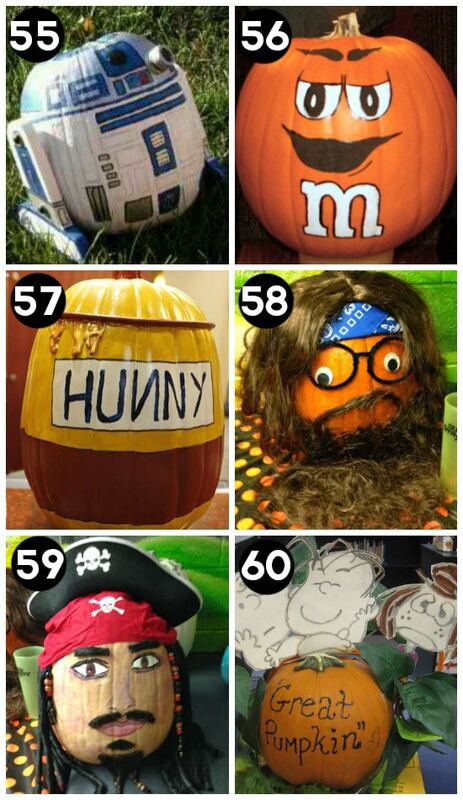 We’ve got 90 of the perfect painted pumpkin ideas for kids of all ages! 1. Black-Glittered Pumpkins– Black glitter and glue are all you need for these fun pumpkins. 2. Button Pumpkin– Glue black buttons onto your pumpkin to form a Halloween message. 3. Spiderweb Pumpkin– This knotted spiderweb pumpkin looks complex but is actually pretty simple. 4. Mummy Pumpkin– This mummy pumpkin is so easy, even the kids could make their own. Get the look with cheesecloth and glow-in-the-dark paint. 5. Glow in the Dark Pumpkin– We just LOVE these pumpkin decorating ideas: with just a little adhesive spray and glow-in-the-dark powder, you could have the coolest pumpkins on the block. 6. Binky Babies– Make a baby pumpkin by sticking a pacifier into a small pumpkin. 7. Old Lady– Turn your pumpkin on its side and use the stem as the nose. Then dress it up with any fun accessories you can find, these glasses would be perfect! 8. Grandma– Check out this grandma pumpkin. I’m loving the curlers in the hair! 9. Dentist– Turn your pumpkin into a dentist or doctor by adding a surgical mask, glasses, and hat. 10. Mrs. Pumpkin Head– We’ve all heard of Mrs. Potato Head, but check out this fun Mrs. Pumpkin Head. Using these parts you can easily create your own! 11. Mr. Pumpkin Man– You can even stack three pumpkins to make a full-bodied version, like this Mr. Pumpkin Man- complete with a tie around his neck. Grab these parts to finish yours perfectly!! 12. Pumpkin Scarecrow– Or stack your pumpkins to make your own version of a scarecrow. 13. Pumpkin Man– Instead of a snowman, make a pumpkin man! 14. 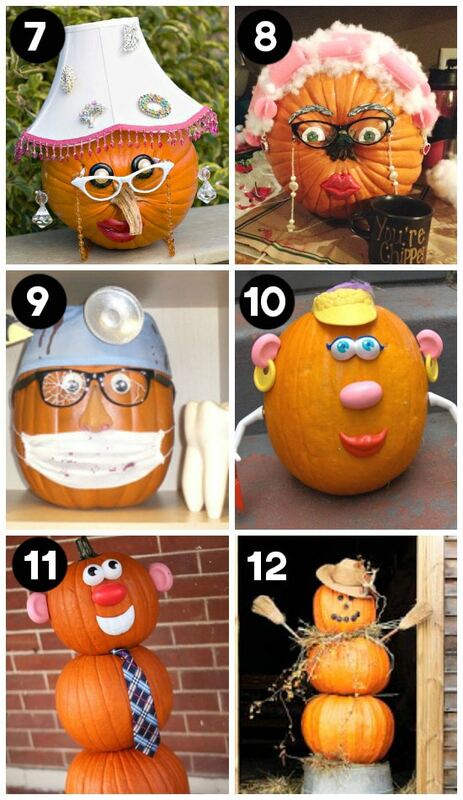 Pumpkin Family– Let each person in the family re-create a pumpkin version of themselves. Don’t you just love the carrot and parsnip noses on these cute pumpkins? 15. Candy Faces– Use a variety of candy to make fun faces on your pumpkins. 16. Witch– Here’s a fun witch hat pumpkin that doesn’t require any carving or painting! 17. Frankenstein– This just may be the cutest Frankenstein I’ve ever seen. 18. Pirate– Add a hat, eye patch, and mustache for the perfect no-carve pirate pumpkin. 19. Clown– Transform your pumpkin into a clown, complete with clown hair and nose! 20. Football Players– This one is for all the football fans out there! 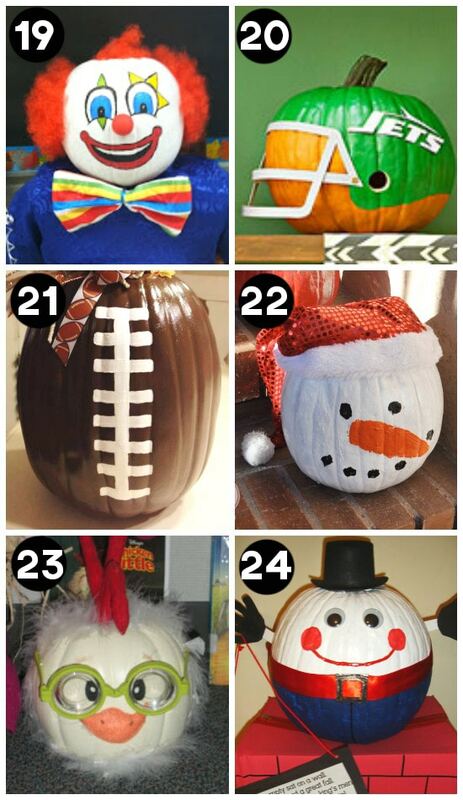 Turn your pumpkin into a football player. You can even paint your favorite team’s name on the helmet. 21. Football– Here’s another fun option for the football fans- just turn your pumpkin into a football! Super simple! 22. Snowman Head– How cute is this snowman pumpkin? The Santa hat just tops it all off. 23. Chicken Little– I’m loving all the feathers on this Chicken Little pumpkin! 24. Humpty Dumpty– Decorate your pumpkin like Humpty Dumpty, complete with the wall. 25. Tin Man– Paint your pumpkin with silver paint and turn it into the Tin Man from The Wizard of Oz. The funnel hat is my favorite part. 26. Minion– This just might be my favorite one! Recreate one of the minions from Despicable Me. 27. Stitch– Add some big purple felt ears to create Stitch from Lilo & Stitch. 28. Shrek– Check out this fun Shrek pumpkin. Just use a little green clay for the nose and ears. 29. Ninja Turtle– Here’s another one for the TMNT fans, and this one doesn’t require any carving! Just add a mask! 31. Curious George– How cute is this Curious George pumpkin? I love his googly eyes and that’s he’s sporting the man with the yellow hat’s hat. 32. Mario Brothers– These Mario and Luigi pumpkins looks pretty simple. Just add a little felt to a red and green hat to top them off, or grab some done-for-you hats here. 33. 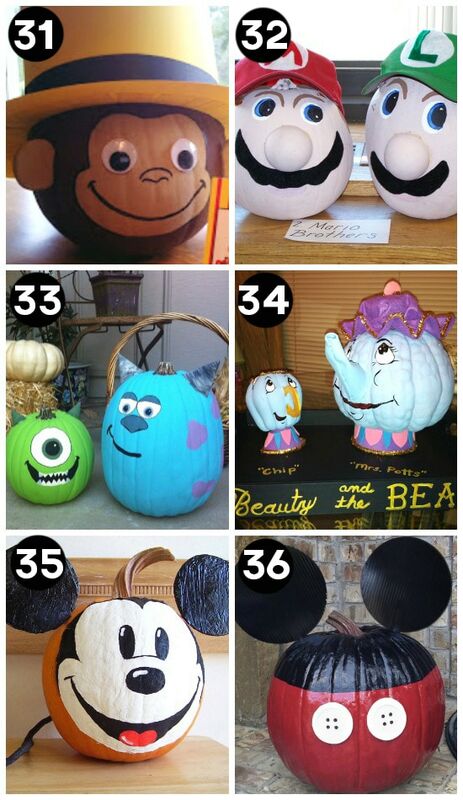 Mike & Sully– Paint a large and small pumpkin to create the famous duo from Monsters Inc.
34. Mrs. Potts & Chip– Can you believe how perfect these Beauty and the Beast themed pumpkins are?! 35. Mickey Mouse Face– This is the perfect Mickey Mouse pumpkin, complete with ears and tail! 36. Mickey Mouse– If painting isn’t your forte, here’s another fun version that would be a cinch to pull off with just paint and buttons. 37. Nemo– Your pumpkin’s already the right color for everyone’s favorite clown fish. Just add fins! 38. Charlie Brown– Use two pumpkins to create everyone’s favorite Peanuts character, Charlie Brown. 39. Snoopy– I can’t get over how creative this one is. Check out Snoopy, the flying ace. 40. Clifford– Turn a big pumpkin into Clifford, the big red dog. I just love the floppy ears and pom pom nose. 41. Pinocchio– Stick a long wooden dowel into the pumpkin to create Pinocchio’s nose- so clever! 42. Pluto– Okay, so it’s not technically a pumpkin- but a butternut squash is the perfect shape to create this Pluto masterpiece. 43. Hello Kitty– This Hello Kitty is super cute and super easy too! 44. Raggedy Ann– Add some red yarn hair to make this darling Raggedy Ann pumpkin. 45. Arthur– No painting is needed to make this clever Arthur pumpkin. 46. Perry the Platypus– Any Phineas and Ferb fans? A Perry the Platypus pumpkin is sure to be a hit! 47. Stay Puft Marshmallow Man– This Stay Puft Marshmallow Man is made out of 10 different pumpkins! 48. Angry Birds– Pick your favorite angry bird or paint them all! 49. Veggie Tales– Use a variety of pumpkins and gourds to create your favorite Veggie Tale characters. 51. The Lorax– Check out the fun furry eyebrows and mustache on this Lorax pumpkin. 52. The Grinch– The green boa on this Grinch pumpkin totally makes it. 53. Smurf– This Papa Smurf pumpkin is one of my favorites. I love the cotton beard and eyebrows. 54. Yoda– Here’s another fun option for all the Star Wars fans. 55. R2-D2– Or if you really want to go all out, try your hand at this impressive R2-D2 pumpkin! 56. M&M– With a little bit of black and white paint, you can turn your pumpkin into the orange M&M. 57. Pooh’s Hunny Pot– Here’s another one of our favorite pumpkin decorating ideas: Turn your pumpkin into Winnie the Pooh’s hunny pot. 58. Duck Dynasty– Use a Halloween wig to create the men of Duck Dynasty. Or make it a snap with this costume! 59. Jack Sparrow– Add a pirate’s hat and a little facial hair to make Captain Jack Sparrow. 60. The Great Pumpkin– Charlie Brown and the Great Pumpkin is a Halloween classic. So why not create the Great Pumpkin? 61. Penguin– This pumpkin penguin is darling and looks simple enough for even the amateur painter. 62. Peacock– Add lots of feathers to make a colorful peacock. 63. 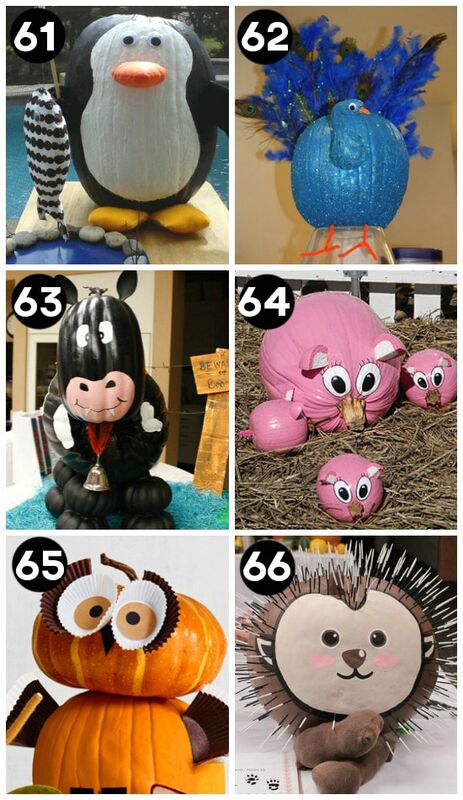 Cow– Ten different pumpkins were used to make this darling Boo-Cow. 64. Pig– I love how they used the pumpkin stem to make the pig’s snout- so clever. 65. Owl– Muffin liners make the perfect wings and eyes. Maybe now you can even raid your pantry for other clever, baking-inspired pumpkin decorating ideas! 66. Porcupine– This cute porcupine’s quills were made with LOTS of toothpicks. 67. Frog– Check out this fun frog prince pumpkin. I love his googly styrofoam eyes and crown. 68. Cat– These tuxedo pussycats can be put together with hot glue in no time at all. 69. 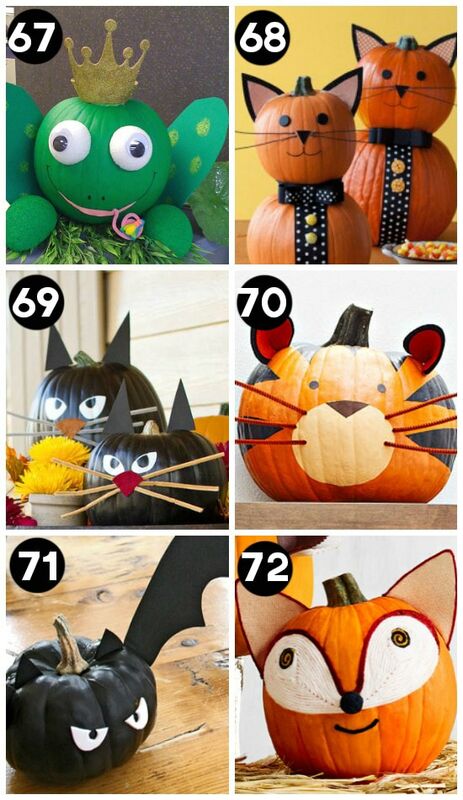 Cat Face– These black cats are so easy to create, the kids can do most of it on their own which basically makes it one of the all-time best pumpkin decorating ideas. 70. Wildcat– You won’t believe how easy this cute wildcat pumpkin is to create. 71. Bat– Just add wings to black painted pumpkins to make the perfect bats. 72. Fox– Coiled yarn is used to make this friendly fox face. 73. Deer– Here’s a funny idea for the hunting enthusiasts. The wooden plaque brings this over the top! 74. Spider– I love the wire legs on this kooky, spooky spider. 75. Black Widow– Black pipe cleaners make the perfect furry spider legs. 76. Pumpkin Spider– Use three pumpkins to make a spooky spider for the yard. 77. Caterpillar– Use a whole line of pumpkins to create this fun caterpillar character. 78. Dinosaur– Cut out pieces of colorful foam to create a pumpkin dinosaur. 79. Globe– Let the kids help you decorate your pumpkin and learn a little geography at the same time with this creative globe pumpkin. 80. Turkey– I love how they transformed this pumpkin into a turkey dinner. 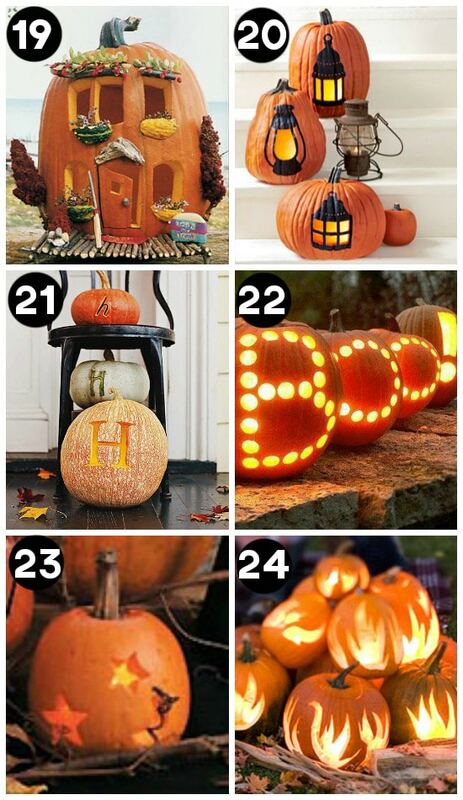 It’s actually one of the more simple pumpkin decorating ideas, too – isn’t that surprising?! 81. Popcorn Bowl– How genius is this?! Turn your pumpkin into a bowl of popcorn. 82. Bubble Gum Machine– This one is sure to win a pumpkin decorating contest! Gumballs were glued all around the pumpkin to create a bubble gum machine. 83. Pumpkin Pie– Here’s an idea for all the math nerds. How about a little Pumpkin Pi? 84. Strawberry– I love ideas like this that are both easy and clever. Seeds were glued on the outside of a red painted pumpkin to create a giant strawberry. 85. Donuts– Paint your pumpkin to transform it into a donut, complete with sprinkles. 86. Caramel Apple– Searching for pumpkin decorating ideas that are cute and sweet? Stick a large wooden dowel into the middle of the pumpkin to create a caramel apple. 87. 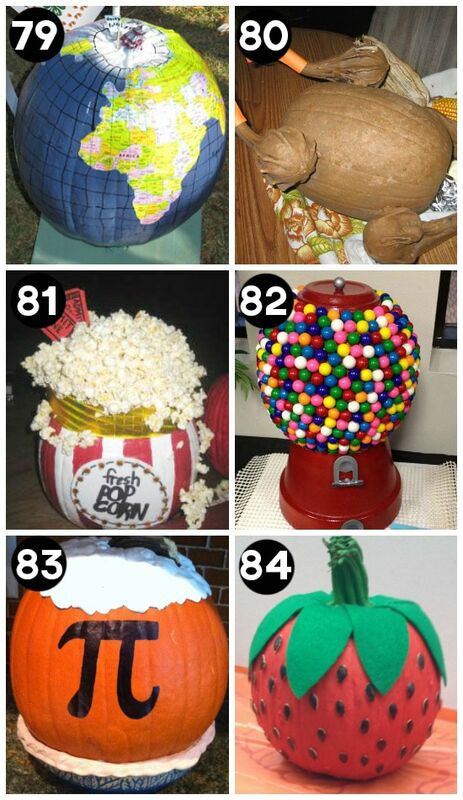 Bag of M&Ms– Lots of painted pumpkins were put together to create a whole bag full of M&Ms – seriously genius! 88. Rootbeer Float– People are so creative! Check out how they turned this pumpkin into an A&W root beer float. 89. Ice Cream Sundae– I love the fluffy cotton “cool whip” on this ice cream sundae. 90. Ice Cream Cone– Stack your pumpkins to make scoops of ice cream on a cone. SO cute and clever! 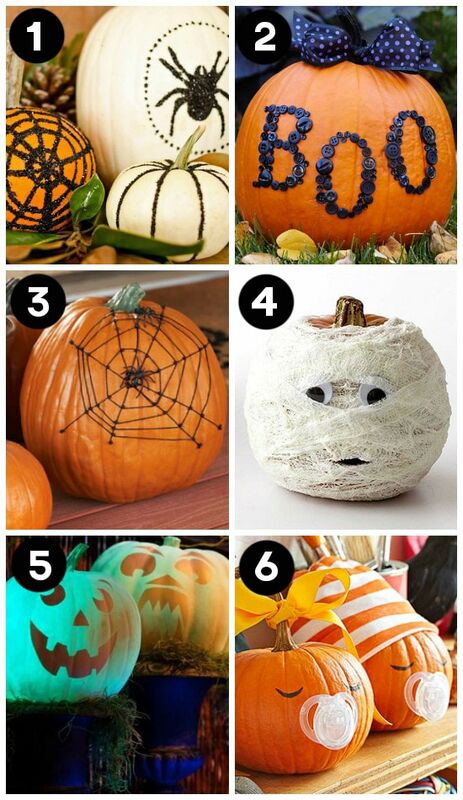 Didn’t I tell you we found some great pumpkin decorating ideas?! 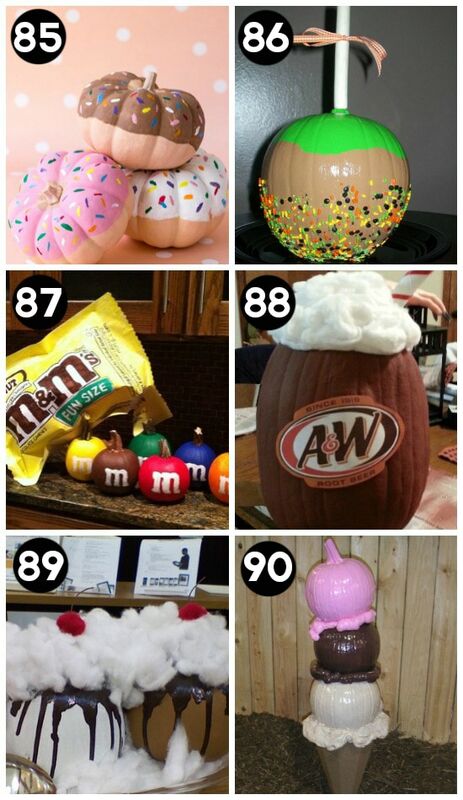 That should be enough ideas to help you win the pumpkin decorating contest every year… for the rest of your life! 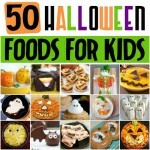 For MORE fun Halloween ideas check out our 50 Fun Halloween Foods. 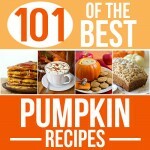 And for MORE pumpkin ideas check out our Ultimate Pumpkin Recipe Round-Up. 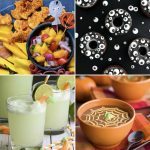 Click HERE for all of our Halloween posts. 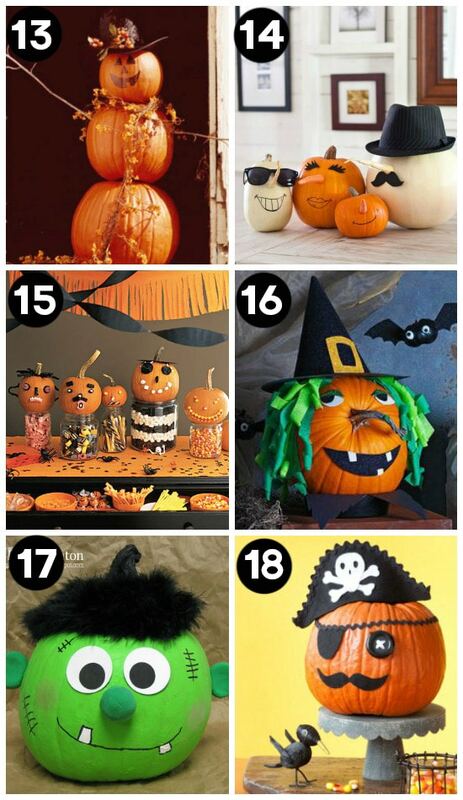 Click HERE for our Halloween Pinterest board. 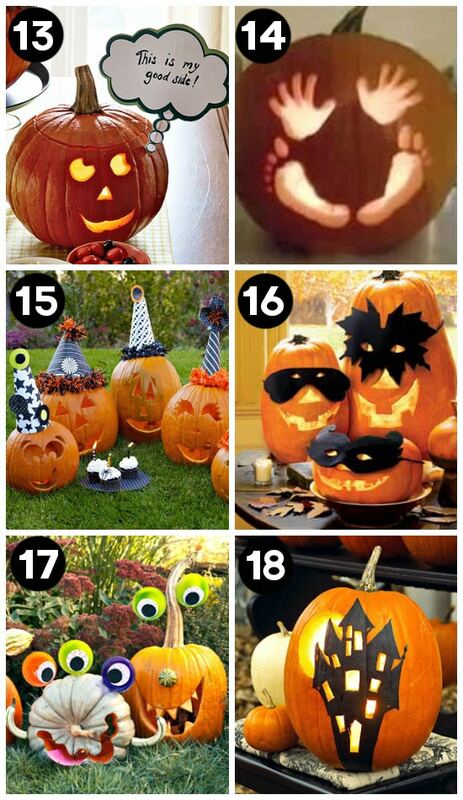 Excellent round up of pumpkin ideas! Love them all! Pinned! Awesome! There are some great and creative things here. The timing couldn’t have been better either! Halloween is just around the corner and I was NOT prepared at all! Oh good- so glad you found it helpful! 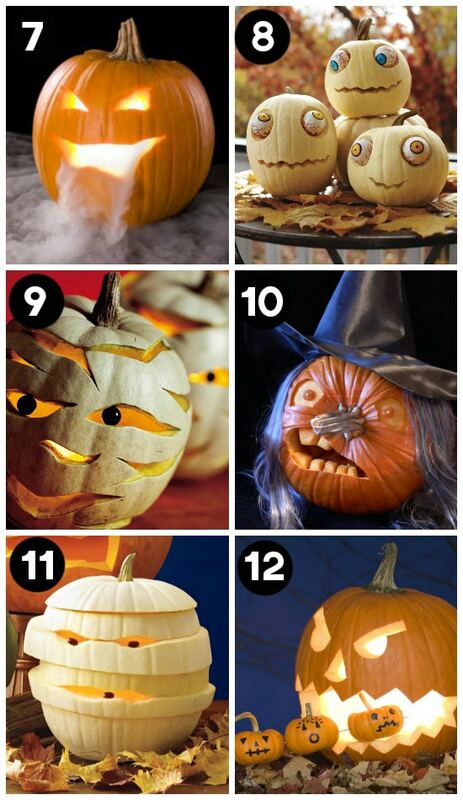 My daughter and I just had a great time looking at all these cute pumpkin ideas. Now I just need her to narrow down her choices – she had too many favorites! LOL! LOL- that’s our problem too. So many fun ideas! Such great ideas! Can’t wait to carve our pumpkins this year! I think it’s my favorite fall tradition! Those are all so fun! Give me all the Disney ones.. they are my favorites! We’re big Disney fans too! 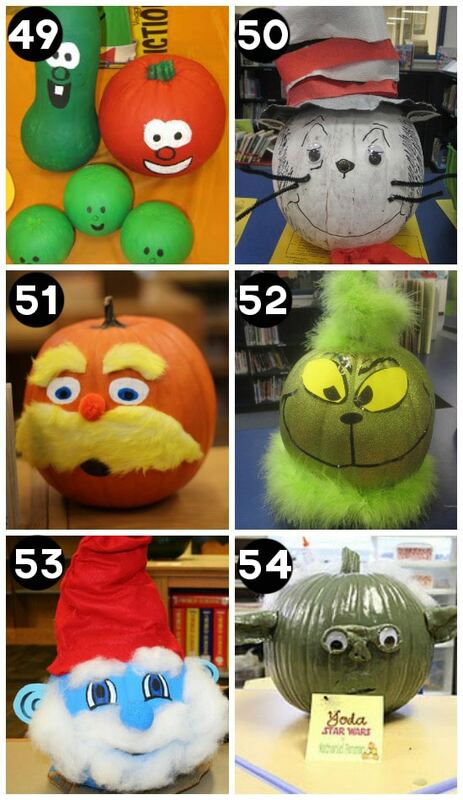 We would love to use some of these pumpkin images on a flyer for our library program. How do we give correct permissions on our flyer for these designs? Thanks for reaching out, Braley! This is a roundup of ideas found from lots of different websites. To get permission to use any of the pumpkin images on a flyer, you’d just need to reach out to the individual site who owns the image you want to use. Hope that helps.